YOU WANT TO EMBROIDER WITH CLOCKWISE. Cool. Here's everything you need to know about it. With over 400 colors to choose from and 15-color machinery to work with, we can do your artwork true justice. With these techniques and more, we can make some really cool pieces. Just let us know what effect you desire and we'll figure out the best way to achieve it. No matter what kind of piece it is, we can trick it out with accents and patches until it's too legit to quit. Are you producing a limited run, or just want enhance your piece's look and value? 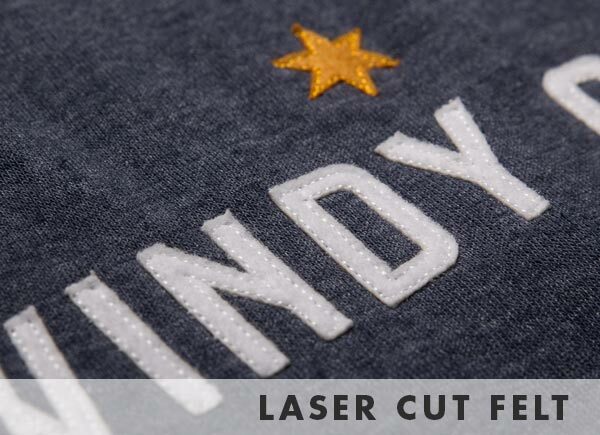 We suggest that you embroider your logo on the sleeve or individually number each piece at the hem.